Handel Street Projects is pleased to announce an exhibition of six new works including three new installations by British artist Gerard Williams. The show builds on a body of work that Williams has evolved over the past few years. Initially he ‘dressed’ plausibly domestic windows, ones visible from the street and near to the commissioning institutions. 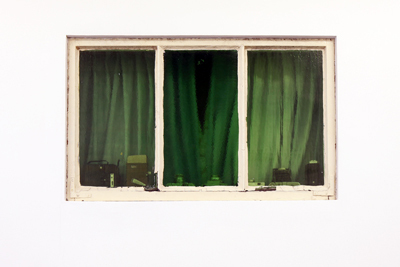 These interventions set out to evoke in the mind of the viewer, the private lives of inhabited spaces, creating through a combination of carefully selected clues, imagined portraits of possible inhabitants. This approach plays on the prejudices and assumptions that we associate with particular objects or visual styles. It reveals something of how we all use these cues to categorise or typecast individuals who we do not know. 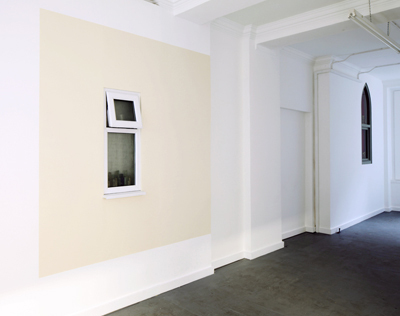 Alongside these, Williams has produced a series of windows for the architectural context of gallery spaces, including a number for his solo exhibition, Fictional Neighbors, at Parker’s Box in New York City (2007). These works also suggest inhabited spaces through the use of both home made and appropriated materials, deploying inference and calling upon a similar process of referencing on the part of the viewer. In this case, however, an interior space is implied where one cannot exist. 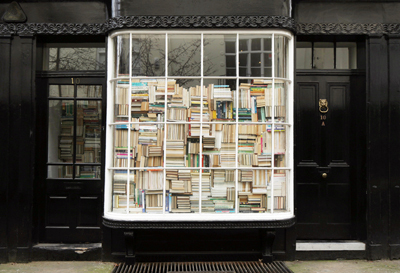 For Handel Street Projects at 19-21 Sicilian Avenue, and for the first time in the UK, Williams presents a group of these works, entitled The Collectors, which takes the form of windows embedded within the walls of the gallery space in a similar manner to those made for New York. 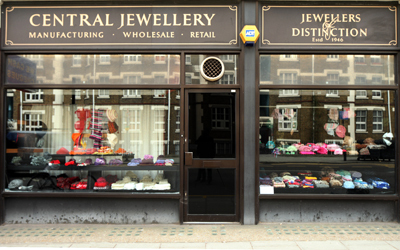 This exhibition will also occupy the street level windows of a number of empty shops owned by Camden Council at 10 Woburn Walk, 19 Bury Place and 115 Clerkenwell Road. 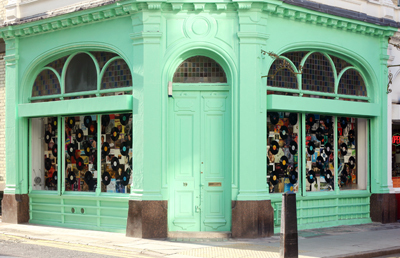 Here, adopting a new approach, Williams will transform each of these empty shop windows into a ‘store’ containing a large number of a specific category of redundant, declining or outmoded consumer products (in this instance books, vinyl records and clothing), thereby touching upon aspects of consumption, recession, nostalgia and the march of technology, seen here in a district with a long history of trade and manufacturing. MAPA TREBA DA SE UBACI !!!!!! The work of Gerard Williams has always been socially grounded, often inviting the audience to re-examine culturally-founded preconceptions. 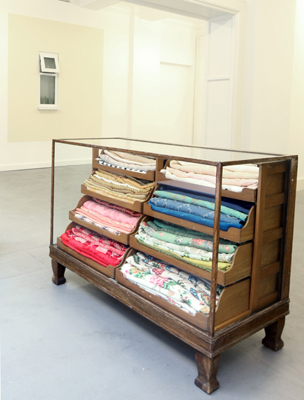 Throughout this entire body of work Williams uses fabric, timber and found objects with his trademark meticulousness and attention to detail, to pursue concerns arising from the relationship of opposites: inside and outside, private and public, made and found, real and pretend. Through all this he questions aspects of the position, reception and role of the artwork relative to context. Over the last three decades Williams’ work has been widely exhibited by international institutions and public galleries. He has also worked with major commercial galleries including both Anthony d’Offay and Maureen Paley in London. His work is held in numerous public and private collections including The Sandretto Re-Rebaudengo Foundation, Turin; The Arts Council of England Collection; The Contemporary Art Society, London; Castello di Rivara, Turin; Leeds City Art Gallery and The Progressive Art Collection, Cleveland, Ohio, USA, which owns three of his recent window works. Handel Street Projects would like to thank Holborn Links Ltd., Camden Council, GVA Grimley and Skoob Books for making this exhibition possible.